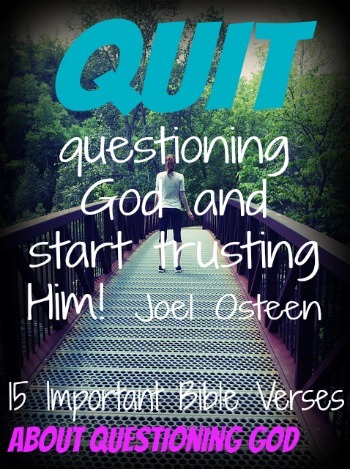 Is it wrong to question God? In the Bible, we often see believers questioning God such as Habakkuk who asks why is this evil happening? God later answers him and he rejoices in the Lord. His question was coming from a sincere heart. The problem is many people often question God with a rebellious untrusting heart not truly trying to get an answer from the Lord. They try to attack the character of God because God allowed something to happen, which is a sin. We don’t have eyes to see in the future so we don’t know the brilliant things God is doing in our lives. Sometimes we might say, “why God” and later find out the reason that God did this and that. It’s one thing to ask God why and another thing to doubt His goodness and His existence. In confusing situations pray for wisdom and expect an answer. Give God thanks daily and trust in the Lord with all your heart because He knows what He’s doing. Even when it may seem like God is not doing anything, He is working behind the scenes. 1. Jeremiah 29:11 For I know the plans I have for you, declares the LORD, plans to prosper you and not to harm you, plans to give you hope and a future. 3. 1 Corinthians 13:12 For now we see only a reflection as in a mirror; then we shall see face to face. Now I know in part; then I shall know fully, even as I am fully known. 5. 1 Corinthians 2:16 For, “Who can know the Lord’s thoughts? Who knows enough to teach him?” But we understand these things, for we have the mind of Christ. 6. Hebrews 11:6 But without faith it is impossible to please him: for he that cometh to God must believe that he is, and that he is a rewarder of them that diligently seek him. Asking God for wisdom in a confusing situation. 7. James 1:5-6 If any of you lacks wisdom, you should ask God, who gives generously to all without finding fault, and it will be given to you. But when you ask, you must believe and not doubt, because the one who doubts is like a wave of the sea, blown and tossed by the wind. 8. Philippians 4:6-7 Do not be anxious about anything, but in every situation, by prayer and petition, with thanksgiving, present your requests to God. And the peace of God, which transcends all understanding, will guard your hearts and your minds in Christ Jesus. 9. Hebrews 4:16 Let us therefore come boldly unto the throne of grace, that we may obtain mercy, and find grace to help in time of need. 10. Q: Habakkuk 1:2 How long, LORD, must I call for help, but you do not listen? Or cry out to you, “Violence!” but you do not save. 11. Habakkuk 1:3 Why do you make me look at injustice? Why do you tolerate wrongdoing? Destruction and violence are before me; there is strife, and conflict abounds. 13. Habakkuk 3:17-19 Though the fig tree does not bud and there are no grapes on the vines, though the olive crop fails and the fields produce no food, though there are no sheep in the pen and no cattle in the stalls, yet I will rejoice in the Lord, I will be joyful in God my Savior. The Sovereign Lord is my strength; he makes my feet like the feet of a deer, he enables me to tread on the heights. 15. Psalm 10:1-4 O Lord, why do you stand so far away? Why do you hide when I am in trouble? The wicked arrogantly hunt down the poor. Let them be caught in the evil they plan for others. For they brag about their evil desires; they praise the greedy and curse the Lord. The wicked are too proud to seek God. They seem to think that God is dead.